Rev. 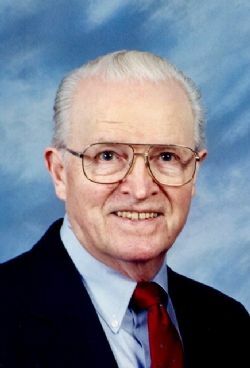 Benard Albert Nelson, 96, of Carmel, Indiana, passed away on April 11, 2019, at the Brookdale Carmel assisted living community. Funeral service is at St. Timothy's Lutheran Church on Friday, April 26 at 10 am in Fremont, Nebraska. Burial will follow at Dalesburg Lutheran Cemetery in rural Vermillion, South Dakota. Visitation will beThursday, April 25 at the Ludvigsen Mortuary Chapel in Fremont from 3pm to 8pm with the family present from 6pm to 8pm. A memorial will be determined at a later date. Benard was born on the family farm in Dalesburg, South Dakota, rural Clay County, to Albert and Emedia (Norin) on Easter morning April 1, 1923. He attended Vermillion High School and agricultural school in Brookings, South Dakota. He was a life-long learner and achieved a Sociology degree from the University of South Dakota, a Master’s in Divinity from Augustana Seminary, Rock Island, Illinois, culminating with a doctorate in Ministry from the Lutheran School of Theology in Chicago. He married Evelyn Harriet Thor on May 27, 1956, in Lake City, Minnesota. They met in Guthrie, Iowa, where Evelyn was a parish worker. Ben met her as a visiting seminary student with his school's choir. Ben and Evelyn spent their lives in ministry together; Ben, as Pastor, and Evelyn as a devoted church organist. Ben was a Lutheran Minister serving the congregations of Trinity/Bristow, St. Andrew’s/Lincoln, Grace/West Point, Nebraska, Christ/Des Moines and Union Creek & Trinity/Akron, Iowa, and finishing his service in Fremont, Nebraska at First Lutheran and St. Timothy’s Lutheran churches. Ben is preceded in death by his parents, brother Raymond (Rosalie) Nelson, sisters Ruth (Kenneth) Hesla & Alda (Clair) Hesla and grandson Adam Oberbroeckling. Ben is survived by his wife Evelyn Nelson, Lowell (Debbie) Nelson, Jim Nelson and Carol (Dan) Oberbroeckling; eight grandchildren, nine great-grandchildren, and 13 nieces & nephews.